Most of our products are sold at Xanath Ice Cream, 951 Valencia St. San Francisco, California, 94110. It’s open Sunday thru Thursday 12 PM to 10 PM Friday and Saturday 12 PM to 11 PM. Saffron it is not expensive because you use very little. For example, when you buy an ounce for $99.95*, divided into 670 portions, your cost per portion is 15 cents. Note that only our saffron will yield that many portions because it has 230/255 degrees of coloring strength. Because our saffron is so pure, we recommend that you use 1/3 to 1/2 less of our saffron. 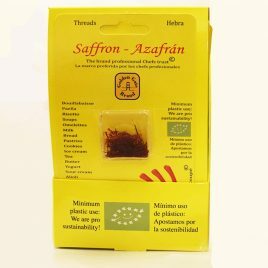 What is the difference between saffron threads and powder? In terms of quality, there is no difference between our saffron powder and threads. If you want powder, we grind it from threads so there is no ““added”” material, in our facility or at the source. When cooking, saffron powder will dissolve faster than threads. If you use threads, you should steep them for at list 20 minutes in a warm liquid in your recipe (ie., water, wine, lemon, milk). There is no need to toast our saffron, because it contains no humidity and it has been completely cured. You may want to crush the threads between your fingers before dropping them in the warm liquid. Where is your saffron from? Our Saffron is grown in Spain. In Iran, they cut out all the impurities (style) according to our specifications; this means to you, the consumer, that you will only get pure saffron (stigma). I don’t want to order online. Is there other way to place an order? How can I have my order shipped to a different address? When you access “Your shopping cart” (by clicking either on “Add to cart” or “View cart”) you will see at the bottom of your screen a check box with the option “Ship to a different address” Click to check this box, and when you go to “Checkout” you’ll get a form where you can enter both your billing address and your shipping address. Can my order be shipped express? Yes, we have a 2-4 business days express shipping option for an extra charge. You will find these options as you complete the order form in your shopping cart. This option applies only to continental US. For Hawaii, Alaska, Puerto Rico and Canada, you must choose the appropriate option, clearly marked on the order form. All orders received before 2 pm California time, will be shipped the same business day. After 2 pm we will try to ship that day, or the next business day at the latest. You will be notified of any problems or delays with your order via e-mail. Depending on your location: West Coast: within 2-3 business days. Central: 3-6 business days. East Coast: 7-10 business days. Why don’t you accept P.O. boxes? By shipping via UPS, packages can be tracked from the moment they leave our warehouse until they reach you. However, UPS does not accept P.O. boxes. Yes, we do. We’ll ship to Canada, Alaska, Puerto Rico and Hawaii, at an extra charge. You may select that option on your shopping cart. For Europe, Asia Basin, Mexico, Central and South America, please send us an e-mail and we’ll tell you how much the charges will be. The shipping charge will be what UPS charges. Or if you have an account with UPS, Federal Express, DHL, you can give us their number and they will charge it to your account. Send the merchandise back and we will refund you the full cost of the merchandise. Do you sell, share or trade your client data with others? No. For more information, please refer to our Privay Policy. Yes. All online transactions are handled through SSL (Secure Socket Layers). For more information, please refer to our Privay Policy.